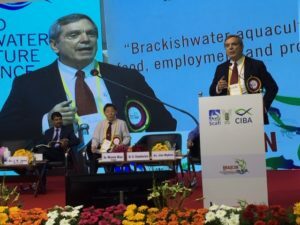 Dr. George Chamberlain, president of the Global Aquaculture Alliance (GAA), was among the featured speakers at the 2019 World Brackishwater Aquaculture Conference (Braqcon) in Chennai, India, from Jan. 22 to 25. GAA’s George Chamberlain addresses a packed room at the opening of Day 1 of the Braqcon 2019 conference in Chennai, India. Hosted by the ICAR-Central Institute of Brackishwater Aquaculture and co-organized by the Society of Coastal Aquaculture and Fisheries, the four-day conference is being attended by more than 1,000 farm and hatchery technicians, academics, scientists, researchers, government officials and other aquaculture professionals, absorbing more than 50 presentations on genetics, breeding, reproduction, feed, nutrition, disease management, environmental responsibility and climate change. GAA is one of 15 premium sponsors of the four-day conference, which is also sponsored by 35 government and institutional organizations, including the United Nations Food and Agriculture Organization. 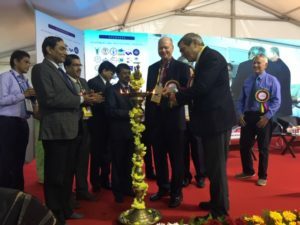 GAA’s presence at Braqcon 2019 is heightened, given that the organization is holding its annual GOAL (Global Outlook for Aquaculture Leadership) conference in India for the first time in its 19-year history, next door to the Central Institute of Brackishwater Aquaculture at the Leela Palace from Oct. 21 to 24, 2019. George Chamberlain, GAA board member Dr. Robins McIntosh of CP Foods and other featured speakers “light the lamp” to mark the opening of the Braqcon 2019 conference. Presenting on the morning of Wednesday, Jan. 23, Chamberlain’s 20-minute presentation was titled “Global shrimp farming industry: Strengths, opportunities and the way forward. “We have big challenges ahead (in the global shrimp-farming industry), and we have to come together and join hands to address those challenges,” said Chamberlain. Chamberlain opened his presentation by asking the audience, “What do we need?” The four areas that he pinpointed were control (managing disease risk, social risk, environmental risk), efficiency (producing more with less), trust (third-party assurance) and marketing (increasing shrimp consumption). “Innovation is driving control and efficiency improvements throughout the production chain. Diagnostics, breeding and pond recirculation systems are key to the future of shrimp farming. And greater trust and marketing are needed for long-term growth,” he said. Chamberlain’s presentation zeroed in on marketing, emphasizing that more transparency and visibility into production and more marketing are needed to truly increase shrimp consumption. “The problem that we’re having right now is shrimp prices. Shrimp prices are up and down. The industry has recovered from EMS (early mortality syndrome), and now we’re operating at near historic low prices. Most countries are focused just on production, and the industry isn’t good about sharing data. Some challenges are too big for us to address alone,” he said. Chamberlain pointed to avocados, which was a highlight of the GAA’s GOAL 2018 conference in Guayaquil, Ecuador, in October. As a result of an industry-wide marketing campaign, U.S. avocado volume has grown from 691,000 metric tons in 2012 to nearly 1 million metric tons in 2017. All the while, avocado prices have firmed and even increased, said Chamberlain, who formed a working group at GOAL 2018 to investigate the possibility of an industry-wide marketing campaign for shrimp. Also presenting at the conference on Jan. 23 was Dr. Ken Corpron, program integrity specialist with GAA’s Best Aquaculture Practices (BAP) third-party certification program, who presented on the benefits of aquaculture standards and certification.